Heart problems are a cause of worry because heart keeps us going and we stop when it stops. Heart attack is reportedly the leading cause of death in both men and women in the US. Heart attack occurs when the blood supply to a part or specific muscle of the heart is lost. It can be caused due to blood clot or blockage (coronary thrombosis) affecting the coronary artery. Loss of blood supply causes death of heart muscle which in turn causes chest pain and disruption of the electrical impulses in the heart muscle tissue. 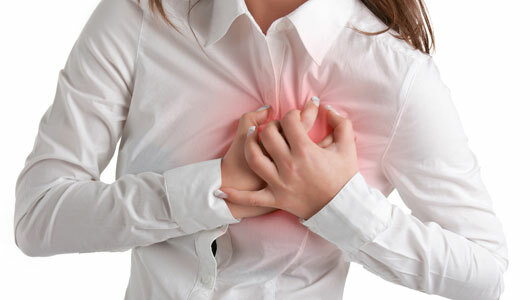 The most commonly known symptom of heart attack is chest pain. However, doctors and scientist have found that symptoms of heart attack are not always clear and it can manifest in many different ways. Heart attack is more likely to affect men over the age of 45 and women over the age of 55 years. If you have suffered from high blood pressure during pregnancy, you are at increased risk for heart attack during the entire lifetime. Diabetes is the condition where the body does not produce adequate quantities of insulin or respond properly to insulin which is produced by the Pancreas. If you are a diabetic or have uncontrolled diabetes, you are at higher risk of developing heart attack. If you do not exercise, you may gain weight and develop increased level of cholesterol in the blood. Aerobic exercise improves the fitness level and decreases risk of heart attack. Exercise also reduces blood pressure. High blood pressure causes artery damage by increasing the atherosclerosis in the long run. This combined with obesity, diabetes, increased cholesterol levels and smoking puts you at higher risk. Low density lipoprotein (LDL) or Bad cholesterol and Triglycerides are responsible for narrowing the arteries as they are major part of the deposits in the lining of the arteries. Increase of these in the blood increases your risk of heart attack. High density lipoprotein or good cholesterol is essential and cleans up the excess cholesterol from the body. If you have relatives who have suffered from heart attack, then you may be at increased risk of a heart attack. Amphetamines or cocaine, which are stimulant drugs can cause a spasm in the coronary artery and lead to heart attack. Obesity is related to other conditions like high blood cholesterol levels, increased blood pressure and diabetes, which puts you at greater risk of a heart attack. Body reactions to stress may somehow increase the risk of heart attacks. Smoking, even second hand smoking, increases the level of deposits in the arteries and slows the blood flow. It also increases the risk of blood clot formation leading to heart attack. Unchecked levels of BP and cholesterol are very harmful; hence, it is good to consult your doctor on the frequency of checkups and monitoring. In case of high levels, medications can be taken to control them and diet can be modified as well. Some of the major risk factors are initially asymptomatic like – high blood pressure, high cholesterol levels and diabetes. Regular health checkups can ensure that these are detected in time and necessary precautions are taken. Uncontrolled diabetes is a major risk factor for heart attack. Medication may be required for some individuals. Exercise and diet can help in maintaining sugar levels in the normal range. Eat a heart-healthy diet: Narrowing of the arteries may occur due to high levels of cholesterol and saturated fats. Lowering the amount of these in your diet along with low salt to reduce blood pressure is beneficial. Your physician and dietitian can recommend a heart healthy diet which is rich in fish, lean meats, fruits, vegetables and low-fat dairy products. Foods rich in antioxidants should be taken as they prevent every day wear and tear of the arteries. Reduce stress: Stress is also a major risk factor for heart attack. Reducing stress by joining fun activities and decreasing workaholic behavior can help. Limit alcohol: Excessive drinking of alcohol increases the blood pressure and triglyceride levels thus increasing the risk of heart attack. It has been found that alcohol in moderate quantities increases the HDL level, which protects the heart. However, if you do not drink alcohol, you should not start for this reason. Exercise regularly: Exercise is very essential as it helps to reduce or maintain body weight. This in turn helps in controlling diabetes, reducing blood cholesterol levels and high blood pressure as well. It also improves the functioning of the heart muscle after a heart attack. Avoid smoking and exposure to it: Smoking is very damaging to your arteries and the best way is to stop smoking. Aids can be used to help in kicking the habit of smoking. Second-hand smoke is equally bad and should be avoided as much as possible. Call 911 or other emergency helpline. Allergies or current medication if being taken should be informed as well. Loosen tight clothing and sit or lie down while waiting for the ambulance. Anxiety worsens the condition by increasing the oxygen requirement of the heart. Taking deep breaths helps in calming down the anxiety. If it has been previously prescribed, take nitroglycerin, as it helps in opening the blood vessels. Call 911 or emergency helpline is the frist thing. The sooner you get help and medical attention, the lesser the damage done and risk of death. Wait for the ambulance or emergency help since they will start treatment as soon as they arrive. Driving to the hospital might take time and is not advisable. Do not call family, friends, doctors and insurance companies prior to calling 911 or helpline. These calls can take away precious treatment time and can be made after the patient has stabilized. Is Grapefruit Good for Diabetes?